The nationwide festivities on the occasion of Novruz, the Azerbaijani national holiday, took place in Baku on Mar. 18. President of Azerbaijan Ilham Aliyev, his spouse, First Lady Mehriban Aliyeva and Vice President of the Heydar Aliyev Foundation Leyla Aliyeva joined the festivities. 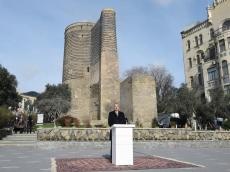 The president and his spouse first arrived at the square in front of the Maiden's Tower in Baku. Children in national costumes performed dances on the square. Art masters sang songs glorifying the spring and Azerbaijan. “Bahar giz” (spring girl), one of characters of Novruz, presented the samani (wheat shoots, a symbol of hope for an abundant harvest) to President Ilham Aliyev. Dede Gorgud, another character of Novruz, gave his blessing and wishing the Novruz holiday to bring abundance to the Azerbaijani people. The president and his spouse were met there by the key characters of Novruz - Kosa and Kechal, who congratulated the president and his spouse on the occasion of Novruz holiday. President of Azerbaijan Ilham Aliyev and First Lady Mehriban Aliyeva watched the festive concert. As part of the festivities, the president and his spouse got acquainted with the Novruz fair.